We don’t need to memorize facts because we can search and find them online. We need to know how to access information that we want or need, how to evaluate the information that we find, use it as desired, and communicate it in ways that are useful and/or appropriate. This post is about step 1: finding information. I teach students about identifying keywords, because I think it’s useful for searching in directories and databases. Search engines tend to be a bit smarter, and are good at answering factual questions. So while it’s still important for children to be able to identify the keyword related to their question, it’s just as useful for them to phrase questions in such a way that the search algorithm returns useful results. When starting a Google search, it’s as good a beginning as any to simply type in your question. Based on the results, you can refine your search using search operators. You may notice featured snippets on some of your results pages. A featured snipped is a potential answer to your question, along with source information. 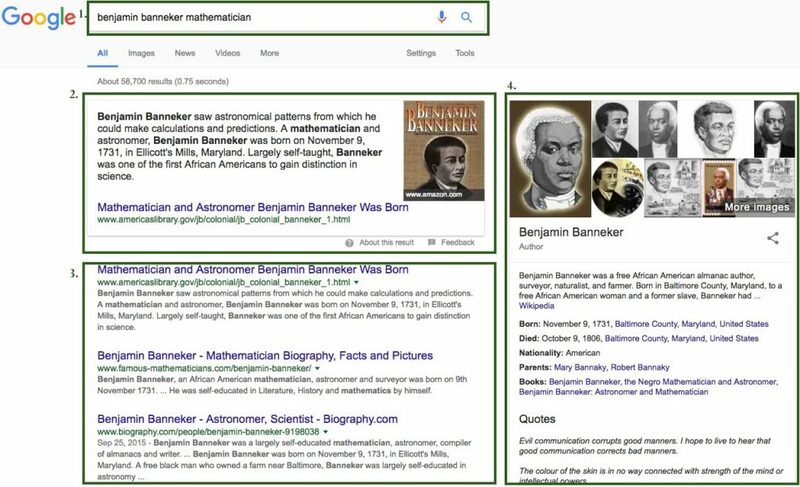 There has been problems with the accuracy of featured snippets so it’s important to be a critical researcher, and not just trust the result in the box. Notice the feedback link at the bottom of the answer box; users can let Google know about their experience with the featured snippets. Another element of Google Search results is the Knowledge Graph. The Knowledge Graph a sidebar at the right side of the page which presents “information about objects in the real world” (Google). The Knowledge Graph is great for jump starting research, for learning more about a topic, and for finding new wonders/curiosities that you may not have known to ask. Note that I usually type my search query to be as short as possible.